About books, reading, the power of fiction, some music, some movies. These are my opinions, my thoughts, my views. There is much wisdom afloat in the world and I like finding it in books. Communicating about wisdom found keeps it from getting lost. This was the fourth Richard Powers novel I read. After being so impressed by The Overstory last year, I decided to read one of his novels every month in reverse order of publication. I usually read an author in order of publication so doing Powers's books this way is giving me the weird sensation of experiencing an author devolving. In fact, so far I have liked each novel just a tiny bit less while remaining in awe of how he ties science and/or the arts to stuff that happens in real life. Powers won the National Book Award for this one and it was also a Pulitzer Prize finalist. Mark Schluter lives in a remote Nebraska town. He has been a slacker most of his life but due to his first steady job in a meatpacking facility, he has managed to purchase a mobile home at the age of 27. Though he spends most of his off time getting drunk and stoned with his buddies, he feels he has got something pretty close to his dream life. Then he has a near fatal car accident in the middle of the night while driving his pickup truck on a deserted road, leaving him in a coma from a severe head injury. Enter his older sister Karin, who has always been his protector. She moves into his mobile home and spends her days by his bedside. When Mark finally comes out of the coma, he is convinced that this woman, who looks and talks and sounds just like his sister, is an imposter. He remembers very little about his accident but a mysterious note left by an unknown person seems to him to be the key to recovering his memory and finding out what happened. Karin, who despite having only bad luck with men, is an intelligent person. Not satisfied with the doctors on Mark's case she does her research and contacts a famous cognitive neurologist, Gerald Weber. This man comes from New England to take a look and diagnoses Mark with Capgras syndrome; the delusion that people in one's life are doubles standing in for the real person. After this the story gets stranger by the page. Gerald Weber is having a midlife career crisis. Karin takes up with an old friend who is involved in a green initiative to save the local river basin from business investors. The basin is a stopping off place in the migration path of sandhill cranes. Karin's old boyfriend is involved with the investors. Mark falls in love with one of his nurses, but Weber is convinced he has met her somewhere before in his life. I read this while I had the flu so in some ways the convoluted plot fit in with my semi-delirious state. Richard Powers has stated in an interview that his intention was "to put forward...a glimpse of the solid, continuous, stable, perfect story we try to fashion about ourselves, while at the same time to lift the rug and glimpse the amorphous, improvised, messy, crack-strewn, gaping thing underneath all that narration." Well, yes he did that at the same time the flu was doing that to me. So I don't know. 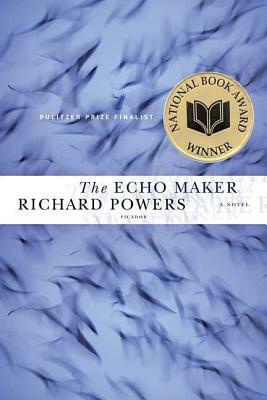 Maybe it was the best time for me to read The Echo Maker. Everything gets worked out by the end of the book, except that none of the main characters remain the same as they used to be. Kind of the way I felt when I got better. This way of reading is interesting, seeing the 'de-evolution'. I might give that a try. The first time I have done this. It is so interesting! Not sure this is for me but OMG, your review made me laugh. Glad u r better! Glad I made you laugh! Reading an author's books in reverse is an interesting idea! It sounds like Richard Powers's work must have improved over time, but hopefully his very early ones will still be good. Every one I have read so far is good. I think he is brilliant. But reading back, book by book, I can see how his polish increased, how his apparently inherent attraction to intricate stories came more and more under his control. I have thoroughly enjoyed Powers' writing. He is a talented writer who manages to present complicated ideas in an understandable, readable form. I haven't read this one, but it sounds typical of his work. Dorothy, if you don't mind could you comment on a couple of your favorite ones? Then I can think about that while I read the books. I did! Glad you stopped by to tell me. I'm glad you enjoyed this one! Love your review and I am so glad you're better now! Thanks, Carrie. It is good to not be sick, that's for sure. The book sounds fascinating. Your experience with the flu and this book is so interesting. I know what it is to be lightheaded and disoriented as a result of illness. I have had odd experiences with television programs along the same lines. It was a weird illness. My body was useless but my mind could assimilate, though in the case of this book I was somehow more open to what was going on. I remember reading my first Elizabeth Hay novel A Student of the Weather during a serious flu a few years ago. I loved it and it made an indelible mark on my brain, but I'm not sure how I'd feel about it if I read with a normal brain. Ha! I like hearing stories of other readers reading while ill. I am afraid I might not have given the book as much attention as it required but that was the way it was. It is better to be healthy than sick. Sorry you had the flu... Ugh, they are never any fun at all ever! The Echo Maker sounds like quite the read only to be made a bit more bizarre while having the flu! I liked your quote; "Richard Powers has stated in an interview that his intention was 'to put forward...a glimpse of the solid, continuous, stable, perfect story we try to fashion about ourselves, while at the same time to lift the rug and glimpse the amorphous, improvised, messy, crack-strewn, gaping thing underneath all that narration.'" Thanks, Lisa. That is quite a quote isn't it? I am so excited about that Pulitzer. You know you are reading a great author when he can slide in on your delirium! This blog is linked to Once Upon A Time Bookstore in Montrose, CA, where I worked for several years. It is primarily a resource for customers to read my book reviews but anyone can now order books from the store via my blog. For store events, reading group schedules and other store info please visit the website. You can now order any title reviewed here (as long as it is in print) in various formats including ebook. To order directly from Once Upon A Time, use the link at the bottom of the post. To order or find the book at your nearest local independent store, click on the book cover image at the top of the post.